Eve Burley and Oliver Devoti in Anthony Burgess' One Hand Clapping. Photo by Emma Phillipson. 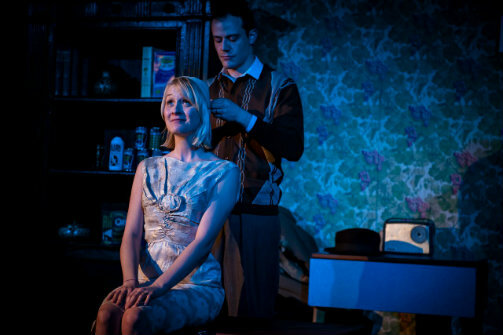 BOTTOM LINE: A well-crafted staging of Anthony Burgess’ pitch-black novel that may leave audiences with unanswered questions about the central couple. Her philosophy comes from the contentment she’s found as a smart but uneducated young housewife, grocery store clerk, and lover of both the telly and a good cup of tea to cure what ails you. Basically, she’s on board with the conveniences and simple pleasures of post-war England. In a bit of funny commentary, Cox pointedly has Janet do faux commercials at home for different products like corn flakes and dishwashing liquid. Her husband Howard (Oliver Devoti), on the other hand, must move items to their rightful spot, worries about a hydrogen bomb, and thinks that a better life was to be had before washing machines and sliced bacon. Howard would rather live in Shakespeare’s time, which he sees as more pure and decent. Howard does have a photographic memory, but sees it as utterly meaningless. He professes to love his wife, but seems unemotional and joyless. Viewed through a modern lens, Howard, at a minimum, probably has OCD, if not Asperger’s; he may even be mentally ill.
After getting over his initial disgust at the idea, Howard goes on a game show when he realizes he can parlay his gift. He wins 1000 pounds and then, using his skills to place bets, increases it to nearly 80,000 pounds. But none of it is for anything permanent like a house – “that’s all finished, you mark my words,” he tells Janet. Howard wants to take an extravagant trip to America and buy his wife clothes. Devoti is effectively intense as Howard ratchets up his doomsday predictions. And Burley keeps the show on a fairly even keel as Janet tries to keep her heart and humor about her. With the appearance of poet Redvers Glass (Adam Urey - funny and smarmy in dual roles as Glass and game show host Laddie O’Neill) whom Howard had indirectly given money to in an effort to better the world, Howard is ever more determined to go in one irreversible direction. Janet, increasingly out of sorts with the changes in Howard, just wants to stay home with some beans on toast and a cuppa. I don’t know if it is my American sensibility (vs. Burgess’ very British, anti-American one) or if my issues are due to Cox’s adaptation, but I was left puzzled. I wonder what we were to make of Howard and his increasingly bleak take on the modern world: this is a man who considers living to be a punishment. It also is hard to imagine what would have drawn two radically disparate personalities like Janet and Howard together. I was never convinced of his great love for her or that it wasn’t something more troubling than passion and affection. Of Howard’s love, Janet says “it’s just like a big smoldering fire.” Are we meant to identify with Janet since she’s equipped to survive in the ease and excess after the war, or should we find her contemptible? Additionally, Janet’s final arc comes out of left field, although I’m unclear whether that comes from Burgess original story or Cox’s adaptation and direction. My questions aside, the performances by the trio are uniformly strong and engaging. The set and costume designs by Meriel Pym vividly recreate the early 1960s boom via period furniture and fashions. Owen Rafferty and Cox’s sound and lighting designs, conveyed through four televisions on stage, give off a suitably slightly creepy, ominous undertone with the black and white images of the game shows and advertising flickering by throughout. Although I didn’t fully click with the story, it’s a thought provoking play by one of the twentieth century’s most trenchant commentators, one whose catalog has been somewhat overlooked in recent decades, and is therefore worth renewed interest.